"Policy holders will renew and recommend, if they have witnessed genuine added value in a repair journey experience"
The Financial Conduct Authority (FCA), which governs the way insurers treat their customers have said 'firms should keep their retail customers reasonably informed about the progress of their claim'. They say that this is a simple way to ensure the customer feels they are being treated fairly. Great communication makes a difference - and this is where ClaimWatch can help. Imagine if everyone around the repair circle felt they were fully engaged in the repair journey. So each customer felt they were the most important part of the whole process. At the same time bringing tangible benefits to your repairer partners. A better, more rewarding experience for all. 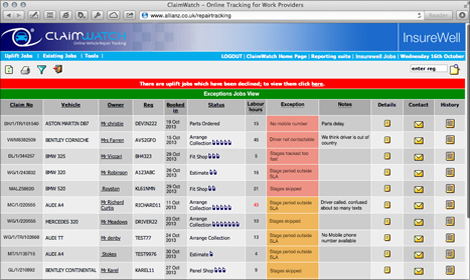 ClaimWatch provides control over the brand that is presented to the driver and policy holder. So insurer clients can each present a complete brand experience for their drivers. Seamless white labelling of Insurers clients services for their valued corporate customers. 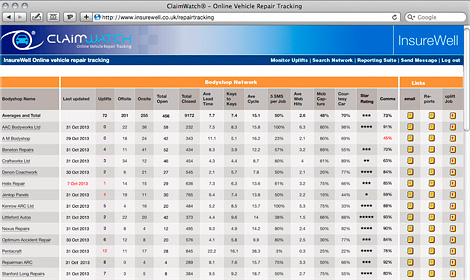 Highly targeted tracking pages on ClaimWatch include, vehicle model types, video promotions, advertising and useful links. This gives each driver comfort and confidence in the brand. As the repair proceeds the repair is pro-actively managed - so delays or issues automatically pop up in the exceptions. The insurer pro-actively contacts the customer, before the customer even thinks there is a problem. The cycle time, reports and communication audit trail are all available on the insurer network repair management tool. Specific MI is also available using ClaimWatch Web Services. A unique measure in communication - bodyshops are scored on various criteria to establish how well they are communicating with the driver and work provider. As the CSI responses come in, the insurer and the bodyshop can see all the comments their driver customers leave, helping everyone analyse and improve their services. Links to most UK management systems including EMACs, BMS, Autoflow, Bodynet, etc.